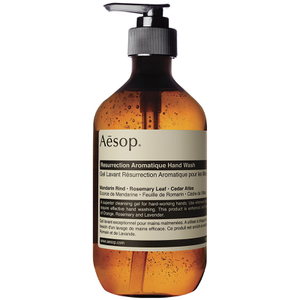 The Aesop Resurrection Hand Wash comes in a 500ml pump bottle and has taken its inspiration from another product in the Aesop range - the hand balm. 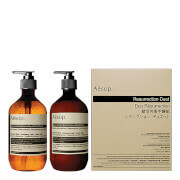 The idea of the Resurrection hand wash was to create a cleaner that would be strong for hands that work hard. Spend a lot of time in the garden? This cleaner is able to shift the dirt and keep the hands soft at the same time, thanks to a great combination of ingredients. If your hands are prone to dryness then the Aesop hand wash is the one for you and makes washing your hands a pleasure. It smells good and makes my hands clean and fresh. I like it and I will buy this merchandise again. Only there is one thing, I hope next time Mankind can package well or it peaked out when i received. 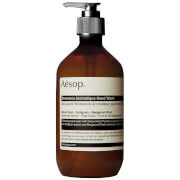 I've used multiple bottles of this Aesop hand wash. I love it. half a pump lathers really well. not forgetting the beautiful scent it leaves my hand after. the only bummer was at my latest purchase, the item was not packed properly and it arrived leaking. mankind, will you be able to wrap this bottle a little more snugly to prevent future leakages? Bottle pump was loose, leaking inside box. Resurrection Hand Wash 500ml is much bigger than I expected, and in this case bigger is better. It smells great and leaves your hands clean and fresh. Very happy. The Resurrection Hand Wash is a great product, it does what it says, with a nice smell. Terrific hand wash! Great smell, I first tried it in Hong Kong and have been addicted ever since! Same smell as the hand balm... citrusy. I like the pump bottle for its clinical look but it's much too expensive for a hand wash. Probably won't buy again. Stumbled across this brand while in Paris and bought it due to the fantastic packaging. Now have ordered it on a few occasions as not only does it look great but it smells fantastic. It is one of those products that is a real pleasure to use.